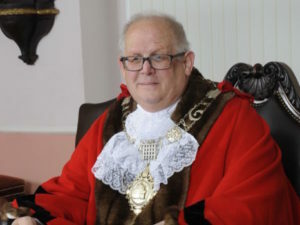 Terry Jermy was born in Thetford in 1985 and was first elected to Thetford Town Council at the age of 22 in a by-election in July 2008. Since then he was re-elected in 2011 and 2015. Terry has also served on Breckland District Council since 2011 and on Norfolk County Council since 2013. 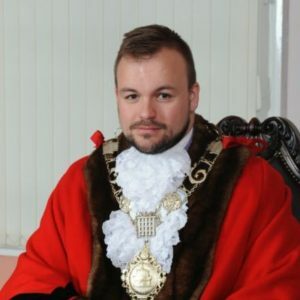 Terry is believed to be the youngest Mayor in Thetford’s history, taking over the role at the age of 30. Sylvia was first Elected to both town and district councils in 1999 then re elected in 2011 and was a School governor at Charles Burrell High School for many years as well as a Trustee for Keystone . A keen sports person Sylvia is a qualified skating coach and taught locally for over 40 years. Currently Sylvia is the Vice Chairman of Riversdale a local charity. During her mayoral year Sylvia raised £3,697.68 for her charities Thetford Town Football Club (renovation fund) and the Riversdale Centre. Stuart is a Thetfordian who is know for his passion and commitment to Thetford’s heritage, being the Chairman of the Thetford Society for over 10 years as well as the treasurer of the National Thomas Paine Society. Stuart is involved in the delivery of both Thetford’s Great Festival and Heritage Opens days as well as being chairman of the Dads Army Museum. 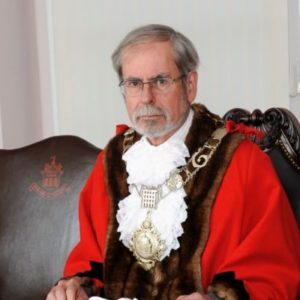 Terry was born and bred in Thetford having a long career in teaching as well as being a town and district councillor since 1963. Terry’s aim was always to protect and preserve the historic buildings in the town. Dr Minns is famous as being Britain’s first black Mayor being born in Inagus in the Bahamas in 1858 and after moving to the UK was educated at Guys hospital in London registering with the British Medical Association in 1844 as MRCS and LRCP. He moved to Thetford in 1885 where his brother Dr Pembroke Minns was already in medical practice and his son Allan Noel Minns was one of the few black officers to serve in the British Army during the first World War as a doctor.